Hi! My name is Mark. 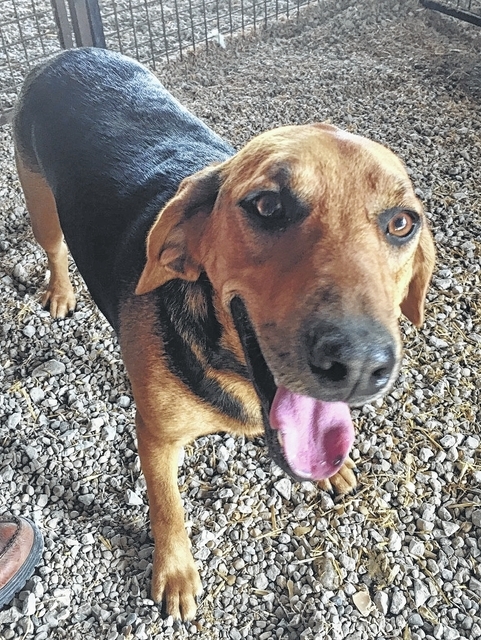 I am about 1-1/2 years old and I’m a mixture of beagle and bloodhound. My person passed away and his good friends kept me as long as they could, but now I am here at Barely Used Pets (I came in with my sister, Mindy) and I’m looking for my new forever home. I am very friendly and love to be rubbed. Won’t you come out and see me? Please visit our website: www.barelyusedpets.com. Also, like us on Facebook. Barely Used Pets is located at 2790 E. U.S. Route 36 in Urbana, Ohio. You can give us a call at 937-869-8090. We are open Sunday 1-4pm, Wednesdays and Thursdays 10am-6pm, Fridays 10am - 5pm, and other days by appointment. We would like to have an in-house clinic to perform all of our surgeries and health checks. We are hoping to provide low cost services to the public as well in the future. Any donations to purchase our medical equipment would be so appreciated! Please take a look at our website for other ideas for donations. Thanks so much for considering Mark and helping us help these little ones find their forever homes! Hi! My name is Mark. I am about 1-1/2 years old and I’m a mixture of beagle and bloodhound. My person passed away and his good friends kept me as long as they could, but now I am here at Barely Used Pets (I came in with my sister, Mindy) and I’m looking for my new forever home. I am very friendly and love to be rubbed. Won’t you come out and see me? Please visit our website: www.barelyusedpets.com. Also, like us on Facebook. Barely Used Pets is located at 2790 E. U.S. Route 36 in Urbana, Ohio. You can give us a call at 937-869-8090. We are open Sunday 1-4pm, Wednesdays and Thursdays 10am-6pm, Fridays 10am – 5pm, and other days by appointment. We would like to have an in-house clinic to perform all of our surgeries and health checks. We are hoping to provide low cost services to the public as well in the future. Any donations to purchase our medical equipment would be so appreciated! Please take a look at our website for other ideas for donations. Thanks so much for considering Mark and helping us help these little ones find their forever homes! https://www.urbanacitizen.com/wp-content/uploads/sites/36/2015/10/web1_Mark-10-4-2015.jpegHi! My name is Mark. I am about 1-1/2 years old and I’m a mixture of beagle and bloodhound. My person passed away and his good friends kept me as long as they could, but now I am here at Barely Used Pets (I came in with my sister, Mindy) and I’m looking for my new forever home. I am very friendly and love to be rubbed. Won’t you come out and see me? Please visit our website: www.barelyusedpets.com. Also, like us on Facebook. Barely Used Pets is located at 2790 E. U.S. Route 36 in Urbana, Ohio. You can give us a call at 937-869-8090. We are open Sunday 1-4pm, Wednesdays and Thursdays 10am-6pm, Fridays 10am – 5pm, and other days by appointment. We would like to have an in-house clinic to perform all of our surgeries and health checks. We are hoping to provide low cost services to the public as well in the future. Any donations to purchase our medical equipment would be so appreciated! Please take a look at our website for other ideas for donations. Thanks so much for considering Mark and helping us help these little ones find their forever homes!